Just looking at a chart and few quarterly reports from Microsoft Corporation (NASDAQ:MSFT) you would have guessed that we must have jumped into a time machine and traveled back to 1999. This isn’t the Mr. Softy we grew to hate. This MSFT stock is growing like a weed and producing ample amounts of cash flow and revenue growth. But this isn’t a vision of the past. Thanks to MSFT’s focus on the cloud and continued focus on software as a service (SaaS), enterprise clients and innovative tech, the firm is back to its old dot-com boom tricks. What’s even better is that the growth in Microsoft won’t be stopping anytime soon. For investors, MSFT stock could be one of the best growth and income picks around. It’s amazing what a fresh look can do. When MSFT decided that it was time for long-term insider CEO Steve Ballmer to retire, it was a really a gift from the gods. Under Ballmer, Microsoft spent much of its time acting like a tech dinosaur. But under new CEO Satya Nadella, MSFT stock is once again exciting. There’s a sentence I never thought I write. That excitement comes from the cloud. Nadella- who was head of Microsoft’s cloud computing division- made the cloud the focus of the software giant. 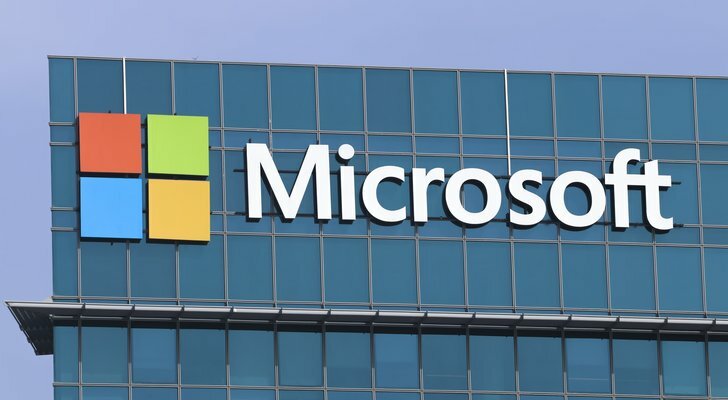 The growth of its Azure cloud platform, Office 365 and other subscription software services have boosted revenues, cash flows and ultimately, its bottom line. Azure is the number two player in the so-called infrastructure-as-a-service (IaaS) market- behind Amazon.com, Inc. (NASDAQ:AMZN) Web Services. However, Azure is growing much faster than AMZN’s offering. Revenues for the software program and server set-up is nearly doubling every year. For the first quarter, Azure saw its revenues surge 90% year-over-year. Azure premium saw its revenue grow by triple digits for the 13th consecutive quarter. All in all, the MSFT’s distributed hybrid model for the intelligent cloud is benefiting it big time and is managing to pull customers away from Amazon and other rivals. At the same time, MSFT stock has had continued and great success in its software as a service (SaaS) forays with Office 365. Home versions of the now subscription software suite have continued to see rising revenues as the PC/tablet refresh cycle continues to be at hand. Perhaps more importantly, Microsoft has been quite successful with its enterprise version of Office 365 at keeping rivals at bay. In addition to access to workplace staples like Excel and Word, Office 365 for business comes with access to programs/apps like Skype, Yammer, Teams, Power Bi and OneDrive. This is a whole suite of communications, chat, analytics and storage options in addition to the Microsoft software we all use. That has helped keep business from migrating to the Alphabet Inc (NASDAQ:GOOG) offerings. You’re going to buy/use Excel anyway, why not use Yammer instead of G Chat? It’s already included. Meanwhile, this continues to drive more revenues into Microsoft’s coffers. Microsoft’s Xbox has been a gaming staple for years, but it was never really more of a hobby business for the company. But that could be changing. In the last quarterly conference call, Nadella looked at building a so-called Netflix, Inc. (NASDAQ:NFLX) for games. At one point, gamers were very adamant about “owning the physical” game and not paying subscriptions to continue playing their favorite titles. However, that attitude has completely changed. With NFLX, streaming and other app-based entertainment options, people have become accustomed to paying monthly to access entertainment. And there lies a huge opportunity for Microsoft. Xbox Live’s network is huge- clocking in at 55 million active users at the beginning of this year. And there is a potential gold mine to turn these users into SaaS clients much in the same way, that now home users of Excel pay for Office 365. And the turning point could be here. Already, Xbox Software & Services revenues jumped 20% year-over-year. For a typically sleepy portion of the MSFT stock earnings call, that’s a big increase. Given its already successful forays with Office 365, milking these users for monthly cash flows shouldn’t be that hard. All of this growth and recurring revenues mean one thing- insane amounts of cash flow. Over the last 12 months, MSFT managed to produce $32.3 billion of free cash flow and $22.1 billion of net income. Those are two staggering sums. With the potential to turn more enterprise clients into Azure and Office 365, those numbers could spike even further. Nadella is already predicting that revenue growth will jump 19.2% next quarter. And we haven’t even touched the surface on Xbox Live’s ability to turn users into subscribers. In the end, the cloud continues to pay big benefits for MSFT stock and it doesn’t look like sky is going part anytime soon. At 22x forward earnings, MSFT is still bargain considering its growth prospects and nearly 2% dividend. Article printed from InvestorPlace Media, https://investorplace.com/2017/12/msft-stock-back-self/.